Quilts tell stories of love and loss, hope and faith, tradition and new beginnings. The Quilts of Love series focuses on the women who quilted all of these things into their family histories. A new book releases each month and features contemporary and historical romances as well as women’s fiction and the occasional light mystery. You will be drawn into the endearing characters of this series and be touched by their stories. You can purchase a copy on the Quilts of Love site. Barbara Cameron is the CBD, CBA, and ECPA bestselling author of 24 books including the new Stitches in Times series for Abingdon Press. 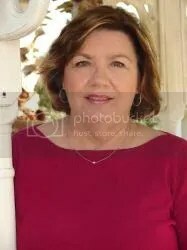 Barbara has written fiction and non-fiction books for Abingdon Press, Thomas Nelson, Harlequin, and other publishers. She sold three films to HBO/Cinemax and is the first winner of the Romance Writers of America Golden Heart Award. Barbara’s first two novellas won the 2nd and 3rd place in the Inspirational Readers Choice Contest from the Faith, Love, and Hope chapter of RWA. Both were finalists for the novella category of the Carol Award of the American Christian Writers Award (ACFW). You can learn more about Barbara and her books at her website. 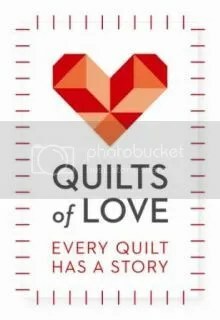 I’ve really been enjoying the Quilts of Love series, this series is written by various authors, can be read alone and have some sort of quilt that weaves through the story and in Barbara Cameron’s book, Scraps of Evidence, it helps to solve a serial murder case and rescue Tess’ aunt from a bad situation. I must admit to being a bit confused when I first started reading as Tess’ aunt’s name on the back cover is Susan but as I was reading it became apparent that her aunt is actually a Kathy – once I got my mind sorted out on this fact it was smooth sailing. The book is fast paced from the beginning and I liked that as it made for a fun and fast read, one can feel the frantic racing of Tess as she seeks to solve her friend’s murder and the realization as to who the murderer is. Once I got into the book and as more characterizations came to light it was fairly easy to figure out who the murderer was but Barbara does a great job in trying to throw suspicion on others through out. Using a quilt to give clues was something I’d never think of and it made for a intriguing process, what if an unsolved murder today has clues wrapped inside a quilt, really thought inspiring. Of course it’s not all murder and mayhem Tess and her partner Logan become attracted to one another – and while there is kissing and touching they each know that to pursue that would be wrong because they aren’t married, I really appreciated that fact. If you like a good suspense, romance or even just need a good, decent Christian fiction book to curl up with then check out this and the other Quilts of Love series books. It’s definitely worth the day it took me to read this one and as I said it’s fast paced so you’ll keep turning the pages (even if you do have to tune out refrains of “MOM”). The ending seemed a bit rushed but even with that the ending was sweet and made for an enjoyable end to the book. If you’d like to see what other readers thought about this book visit the Litfuse Landing Page. 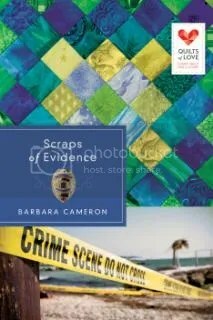 Barbara Cameron‘s Scraps of Evidence is the newest book in the Quilts of Love line, and Barbara is celebrating with an “intriguing” Kindle HDX giveaway! 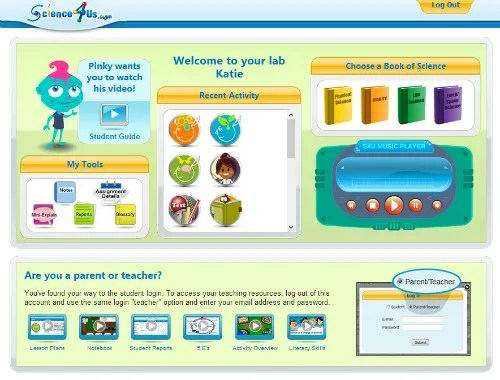 Sometimes I grow tired of reading aloud from a book during our school time so when I had the chance to use and review Science4Us.com through the Schoolhouse Review Crew I was very excited as was my 7 year old son who is working at a 1st/2nd grade level depending on the subject. I was given the Science4Us.com Online Subscription for the purposes of the review and my son and I worked through it and he had a lot of fun with it – the homeschool version is only $7.99 a month per student. This online science curricula is for grades kindergarten through second and depending on the child you may be able to work at, below or above depending on what they’ve been learning. While it starts at Kindergarten my son and I preferred to use the second grade activities for the purposes of the review and that was a perfect starting point for him, some of it was review while other areas were brand new to him. Science4Us.com covers several areas of science such as; physical (matter, energy, and force and motion), inquiry (science tools), life (living/nonliving, animals, and plants), and earth/space (history of earth, materials, exploring the universe and more). The whole program is online and is correlated to second grade science curriculum standards which makes sure there will be no gaps or something overlooked in the program. There are over 350 activities including hands-on, worksheets and online activities through the whole curricula and all are a lot of fun and keeps the child engaged through out the learning process. It isn’t all about science though as it also teaches math and language skills (such as the Silly Bulls part which is actually about learning syllables). I had my son begin in inquiry which was a basic introduction to measuring, senses, and note taking – the one issue he had (as did I) was that with the measuring it was all done in the metric system, which I did not learn nor do I teach, so that had me having to help him a lot in that area. 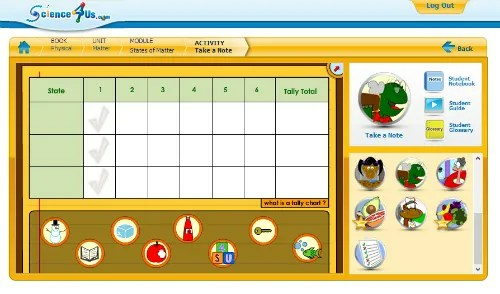 In order to get the most use of the program, in my opinion, make sure you have the ability to print and open PDF documents, so you can use the worksheets that are available and if you prefer you can also print off the days or the weeks lessons if you’d prefer to have a physical copy versus looking at the online version. As the parent I am able to go in and create assignments for my son, and I really liked this feature – I can assign all or parts of the lesson and also give a start date and finish by, I usually just left this as open ended because some days he may do 4 sections or he may only do 1. In the teaching home screen I can watch a video about how to use the program, manage my students, and other items that can help me set up assignments for my students as well as other teaching tools to make full use of the second grade science lesson plans. I let my son decide which area to pursue after he finished the inquiry section and he completed two others, animals and food webs – next he’ll probably move on to space. Once I set up the assignments for him he’s able to log on by himself and start working although I do ask him to do the first three areas, engage, explore, and explain first after which he can do any of the other assigned areas except for evaluate in any order he would like too. There are lesson plans to go by if you really want to be the one doing the teaching and using the online component after doing the laid out lesson plans. The whole section is laid out down to even how long it will take to teach that area – including print offs for both student and teachers and how to do the offline activities in both a group or an individual setting. My son has been able to work almost independently although he did need some assistance with the syllables part of the lesson but that gave me a reason to get more involved and see him use the program during the review. I would like to mention that since this science curricula meets national and state standards that it is more secular in it’s approach especially in the sections for Earth. It does teach that there were no rivers, lakes, trees, mountains or animals and it goes by BYA (billions of years) and also teaches that the earth was once a big ball of hot molten rock that no living thing could live on (there was no air either). With that said, this was the only area that I had a problem with and my son hasn’t completed this one but when he gets to that point we will be discussing it from a Christian perspective that God made the Earth and how each thing was created by being spoken and over the course of a seven day week. Of course, the option is there to also skip over that section entirely or as I said cover it but also go over it using an age appropriate discussion of how God really created the world. Overall, I really liked this science as did my son – I initially also had my 9 year old daughter who is working at 4th grade level do it so she could give me more input but she found it too easy so I didn’t make her continue doing it, opting instead to watch my son and get an idea of the program that way. It was easy to set up and easy to use – even for my son who can become quickly frustrated by the computer this was easy for him to figure out and access. He really enjoyed the student notebook in which he made entries like drawings or activities he had to complete and save and he could pull them up again to look at and review what he’d previously learned. If you’d like to you can also follow Science4Us.com on Twitter, Facebook, Pinterest, and Google+ if you’d like to keep up with them and any changes they may make. 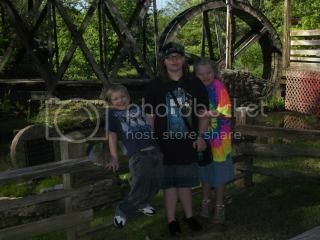 Be sure to visit the Schoolhouse Review Crew blog to see what other homeschool parents thought about Science4Us.com. You can purchase a copy on Kregel. I have a confession – I have never, ever read C.S. Lewis. I’ll let the gasping quiet before I continue. 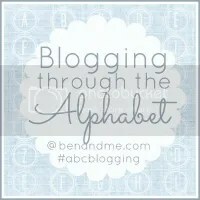 Okay, now that that is out – let me me tell you about this encyclopedia titled The A-Z of C.S. Lewis, I chose it not because I love his work but because the man intrigues me. 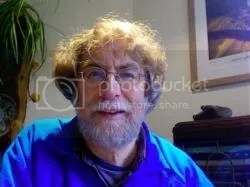 I knew at one time he was agnostic even though he was baptized as a baby in the church, and later returned to the Church and Jesus – much like my own testimony, except I made the decision to be baptized and then turned and then came back. I digress. I have watched the movies of Narnia and have listened to the audio drama of the Screwtape Letters and have enjoyed them, but for some reason I’ve never been able to get into the books – but after reading through this book by Colin Duriez I will try to change that this year. The book literally takes you through the alphabet and how it relates to Lewis’ life, and what I appreciated was the * the author uses so that if something else needs further explaining such as “The Abolition of Man” an asterisk by education means you can turn to E and find education and read more on Lewis’ thoughts on education. If there is something that needs more elaboration on the topic Duriez lists further readings that you can find to read up more on the subject – since this is more of a concise book rather than a text on Lewis’ life. At the end of the book is a bibliography of C.S. Lewis which covers writings by him, posthumous writings and collections, and a selected list of books about C.S. Lewis. 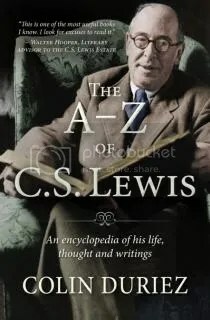 Whether you’ve read his writings or not or maybe are just curious about the man who is held in esteem in the Christian community and for his writings, this is a great book that can help you out in understanding the multifaceted Lewis. 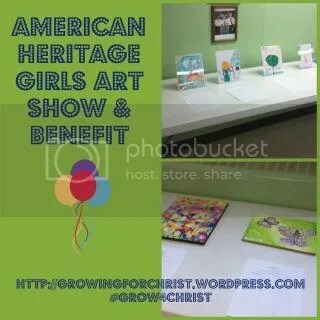 Yesterday, we held an Art Show and Benefit for our American Heritage Troop and it was a great success. A little background – my oldest daughter, in order to earn her Explorer level award, has several things she must complete such as earning a badge in each frontier, planning a special event for our Troop with a minimum of 2 hours planning, and other items. This was her special event and honestly it took way more than 2 hours to plan the whole thing, she began in November and the culmination was yesterday. Her aim was to raise money for a local charity and she chose Interfaith Hospitality Network – and will be presenting them the check at our next Troop meeting in March. Some of the artwork – a hedgehog, a tree, Merida from Brave and the bid sheets. So after IHN agreed to let her use them as her charity, it came down to getting the girls and their siblings to make artwork and did they! We had 39 pieces of artwork from drawings, computer pictures, clay pots and more – there was a wide variety of art and she is hoping to make it bigger next year. The Troop coordinator provided sandwiches, and everyone else pitched in with baked goods, ice, paper good, and soda and it came together nicely and all the hungry children were able to grab lunch after church. 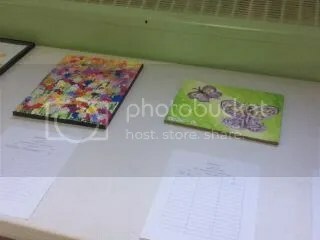 She set the minimum bid at $5.00 for each piece of art and there was active competition for some of the pieces! It was fun to watch my 7 year old son bid against a woman of my age and cousin to one of the girls for a potholder – yes, my son WANTED that potholder, never mind he could make one at home himself!! He did end up winning a pastel drawing of a bird – we also won two pieces of my own children’s art back and my oldest’s drawing of Meridia made one little girl VERY happy. The butterfly painting was hotly bid on through out the entire one hour benefit auction. 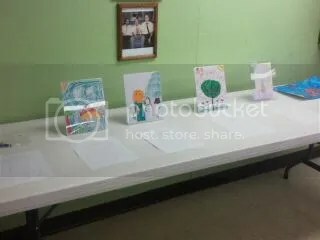 Suffice to say it went very well and we brought in just under $300 for the charity, unfortunately my daughter got sick Saturday evening and she was unable to come to her art show. I’m glad that she’ll at least be able to present the check to the representative though as that is sort of the end result of the whole thing and she’s one step closer to earning her level award in May. I’m so blessed that we have such a great organization to be a part of that instills a love of God, family and community in our girls and where they can learn and grow. Elizabeth is at a crossroad. She’s been given the chance to experience life outside of her community, away from the responsibility to care for her eight younger siblings, but Elizabeth Bontrager can’t decide which road to take. Goshen has its charms and pressures, but Paradise, Pennsylvania, sounds . . . well, like paradise. And it’s also home to her Englisch friend, Paula. Decision made. Elizabeth is Paradise bound. But will the small town live up to its name? When Elizabeth meets Paula’s friend, Bruce, she quickly learns he wants more than a friendship. And the same might be true of Saul Miller, her new boss at the country story that sells Amish products to the Englisch community. As the two compete for her attention, Elizabeth is surprised to realize she misses her family and becomes even more uncertain about where she belongs. She has a choice to make: return home or embrace this new life and possibly a new love? Barbara Cameron is a best-selling author who has a heart for writing about the spiritual values and simple joys of the Amish. 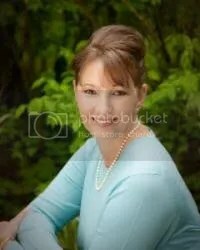 She is the author of more than 38 fiction and nonfiction books, three nationally televised movies, and the winner of the first Romance Writers of America Golden Heart Award. Barbara is a former newspaper reporter. Some of her non-fiction titles include the Everything Weddings on a Budget Book and Her Restless Heart: A Woman’s Longing for Love and Acceptance. 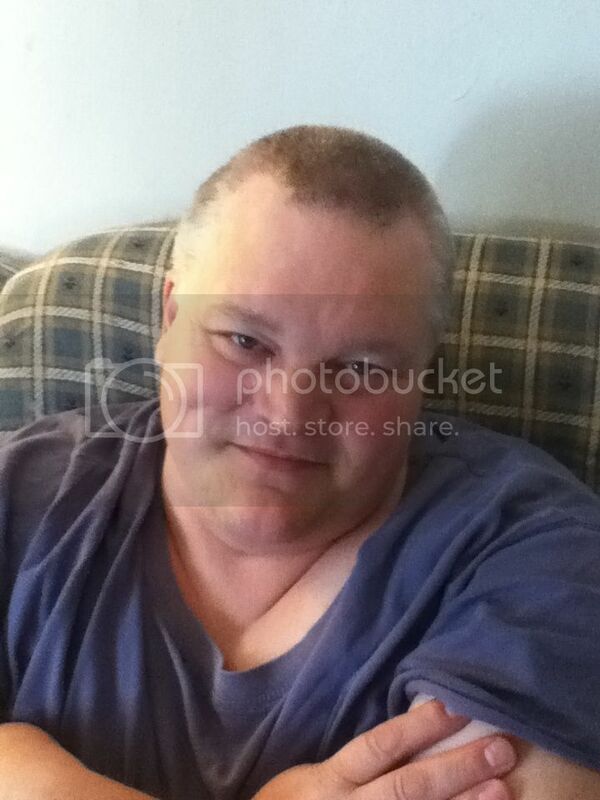 Cameron currently resides in Edgewater, Florida. You can visit Barbara on her website. I think Barbara Cameron just became one of my favorite authors – I’ve not read anything else by her but A Road Unknown which is the first book in her new series titled, Amish Roads Series, was great! Elizabeth Bontrager doesn’t know where she belongs or what she should do with her life, so when we meet her she’s boarding a bus from Goshen to Paradise and she struggles with her choice to leave her family to find out what God wants of her. Saul Miller is also boarding the bus back to his home and store in Paradise and helps Elizabeth with a stranger who is making trouble for the young Amish woman – God does work in mysterious ways. Elizabeth learns who she can trust and also where God wants her to be – and she even begins to entertain the notion that she’d like to have children of her own, realizing taking care of siblings is not the same thing. There is some twists that occur which make the book and exciting read and not just a romance, so I appreciated that and Saul and Elizabeth’s romance is quite chaste, another aspect I appreciated. The only reason I wouldn’t give this to my oldest daughter would be Elizabeth’s and her room mate discussing what “men really want” but overall this was a great book and I look forward to reading the second book, Crossroads, when it’s released. To read what others had to say visit the Litfuse Landing Page. 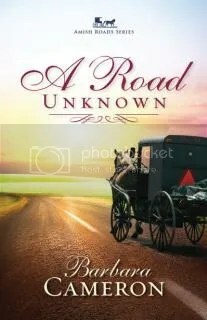 Barbara Cameron is celebrating the release of A Road Unknown with a $200 Visa cash card giveaway and a fun “Amish Roads” Facebook party. Enter today by clicking one of the icons below. But hurry, the giveaway ends on February 27th. Winner will be announced at Barbara’s “Amish Roads” Facebook Party on February 27th. Connect with Barbara for an evening of book chat, Amish trivia, laughter, prizes, and more! Don’t miss a moment of the fun; RSVP today. Tell your friends via FACEBOOK or TWITTER and increase your chances of winning. Hope to see you on the 27th! 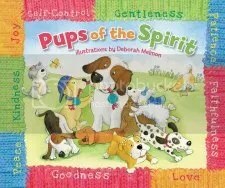 With adorable pups, kids will enjoy learning fruit of the spirit traits including Love, Joy, Peace, Kindness, Patience, Faithfulness, Gentleness and Self-Control in an easy-accessible way. Nine Fruits of the Spirit would normally be difficult for little minds to keep track of, but now there are nine personable pups to make it easier and more fun. For puppy lovers and kids ages 4-8 comes a clever picture book that teaches children in a creative way about God’s special attributes for his people. Each of the canines represents one of the Fruits of the Spirit, introduced one by one with playful rhyming text. Max is filled with love and likes to greet people with a sloppy smooch; Pete the basset hound is so peaceful he falls asleep; Gigi is soft and gentle with God’s creatures. Children, their families, and their teachers will fall in love with the “heavenly hounds” while learning how they can grow closer to God every day. You can purchase a copy on Zondervan’s website. My son was ecstatic when this book arrived in the mail – he loved the puppies in it and the bright, colorful illustrations which did great in keeping his attention as I read, even his 9 year old sister found it interesting and listened in. I love the Scripture about the Fruits of the Spirit and often when I haven’t shown them the Lord uses it to convict my spirit that I need to work on something whether it be having joy in a hard time or showing gentleness to a crying child when all I want is to read – so I want to teach them to my children as well. I love how each pup has a name that relates to each spirit to enable a child to remember the spirit alongside the puppy, making memorization and recall fun – no one ever said Bible study and memorization had to be staid and dull. While all my children love animals, the puppies resonated with my son as some were rough and tumble – while some were girly – but dogs seem to be a hit with children of all ages (my 12 year old thought they were cute too). I think my only complaint would be where God is referred to as He or Him the H’s aren’t capitalized – which is what I was always taught to do when referring to God you capitalize the H, however I also recognize that young children who are just beginning to read and are taught capitals belong only at the beginning of sentences could become easily confused as to why there is a capital H in the middle of the sentence. Otherwise, this is a cute book to introduce young children to the Fruits of the Spirit, the pages are sturdy and it’s hard back which hopefully will withstand years of use and it comes with a dust jacket that turns into a poster! My son is eager to get moved into his new bedroom where I promised I will hang it up for him, even though it goes against everything I believe is a bibliophile. I had several words I wanted to use for T but decided to stick with something simple and came up with T is for Timeline. When we first started homeschooling I didn’t think timelines were great things but now I truly enjoy them and we enjoy seeing our progress through history through the year – we started with Mystery of History Volume I (only my oldest 2 fully completed that volume) but did not take the time to make the timeline. You can read more about our timelines here and here. Anyway – we’ve almost completed our 2nd full timeline which is for Mystery of History Volume 3 – we have only about 12 more figures to add. I was planning to be finished with Volume 3 by now but we’ve had a lot of things come up so it’s taking us longer to finish what I wanted too in regards to history as well as science. 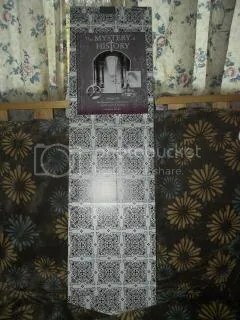 Our Mystery of History Volume 3 timeline folded up. Our next time line will be for my middle daughter’s communication American Heritage Girls badge in which she will make a timeline depicting the history of communication such as writing, telephones, morse code, telegraphs, etc. The problem with this is finding a good source that is based on our worldview and not millions of years (most secular time lines don’t show language developing as soon as we believe it really did). For that timeline I’ll be printing blank sheets off the internet and we’ll put them in a folder or three ring binder for ease of transporting to our AHG meetings when she has to share her timeline. I’m excited for this one. Almost finished timeline for Mystery of History Volume 3. Timelines are great so that children (and adults) can see how one event coincided with another or where someone or an event is placed in history. Want to know what was going on in a certain Dynasty in China – take a look at a timeline. Not sure which explorer was exploring America before it was America – take a look at a timeline. There are many uses for timelines and they are really good in helping everyone ‘see’ history and put it into context – and how it fits into His story. Of course you don’t have to do how we did there are many ways to do timelines – I’ve seen them in three rings binders, index cards stored in boxes, I even have a friend who uses a wall to make their timeline. This one works great for our school though with limited space and even more limited wall space – we can pull it out at will and fold it up and put it away when needed. Even once we get moved I like the idea of being able to fold it up out of the way. I’m actually looking forward to hopefully cycling back through Volume I again and making at timeline for that one because we didn’t do that the first time around, of course at this point it will only be my youngest doing it because we need to get through Volume 4 – or I have my oldest do Volume 4 on her own making a three ring binder time line and my middle and younger children doing Volume I with me. We’ll see. One note – I do not make the figures. 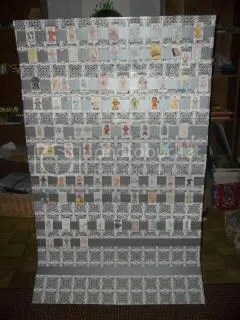 I use the free ones and I print them out and allow the children to decorate them – this is their timeline and I want them to feel a sense of ownership, plus I realize they don’t learn as much if I do it. I have had to overcome my want of perfection when it comes to the figures – I tell them briefly what ideas Mrs. Hobar has for each event or person and let them color and design their figure. The only thing I do is cover it and then tape the figures on (I’ve found out gluing does not work). With a 7 year old boy, a 9 year old girl and a 12 year old girl – there are varying levels of artistic talents and abilities and it makes for quite a timeline but I know one of these days we’ll all look back on them with fond memories. If you’d like to comment I’d love to know if you do timelines, how do you them? ReCreatable begins with the story of a glass baking dish, the delectable aroma of tantalizing brownies, and an unseen defect that turns the promise of something delicious into a minor disaster, leaving glass fragments and brownies irretrievably intermingled. Both the dish and brownies are irrevocably lost. The implications for us are inescapable: created by God to reflect his glory and for his pleasure, we have been broken by sin to the point that we are completely useless to accomplish the purpose for which we were made. But, unlike the shattered brownie dish that gets discarded as worthless, God takes the shards of our lives and does the miraculous. He does not simply fit us back together. He takes those splinters of our destruction and uses them to re-create us: complete, restored, redeemed, and fitted to do and be all that he ever intended for us. 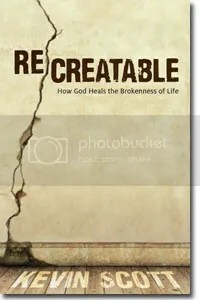 ReCreatable leads us progressively through the impact of the creative genius of God in our lives. It points us to the reality of restored relationships, the resurrection of our role as true reflectors of God’s glory, and the revolutionary life that can be ours when we learn to be true disciples—re-created to live well for God. I wish I had had more time to actually work through this study because I think I would have gotten more out of it if I had had the time to sit down and work through the questions at the end of each chapter. This study is so relevant today in our culture that tells us we are only worth how much we weigh, how we look or what we do for a living – but God isn’t about that, no matter what you’ve done in the past, how much you weigh or what you look like the Lord can and will redeem us and recreate us in His image and how He wants us. Is it hard to believe and hard to see – yes it is – our flesh rebels and wants that instant gratification of being in the in crowd with our peers but God has something so much better. At this time in my life I feel broken, the broken baking dish with the ruined brownies – I’m floundering and that is why this study hit home because I know the Lord wants to recreate me but it’s the idea that He can and will, on His time that makes me pause. There are three parts of the book: reflect His glory, by living well and in a pocket of the kingdom divided into 12 chapters that go even further into the ideas of the part you’re reading. I really liked the idea that there are places where the spiritual realm is so much closer to us than we realize – it’s based on a Celtic idea that the veil of Heaven is lifted and so there is a ‘pocket’ that allows us to be closer to the Lord. If we listen and are aware we too can find those pockets – I know I’ve personally had an encounter like that many years ago. The chapters may be fairly short but the whole book is one that will have you delving deep into your life and allowing God to recreate you – as the book description says He can take those broken shards that you think are un-usable and He can put them back together into something beautiful, and even better than before – if only we get out of the way and allow Him to do His work. Enter today by clicking one of the icons below. But hurry, the giveaway ends on February 23rd. All winners will be announced February 24th at Shelley’s blog. Enter today and be sure to visit Shelley’s blog on the 24th to see if YOU won one of the books! Miriam Zehr has worked at the Sugarcreek Inn longer than she cares to admit. The restaurant is a favorite of town residents as well as the many tourists who come to taste the famous Amish fare. Though she always tries to have a smile for every customer, deep down Miriam knows something’s missing: a family of her own. 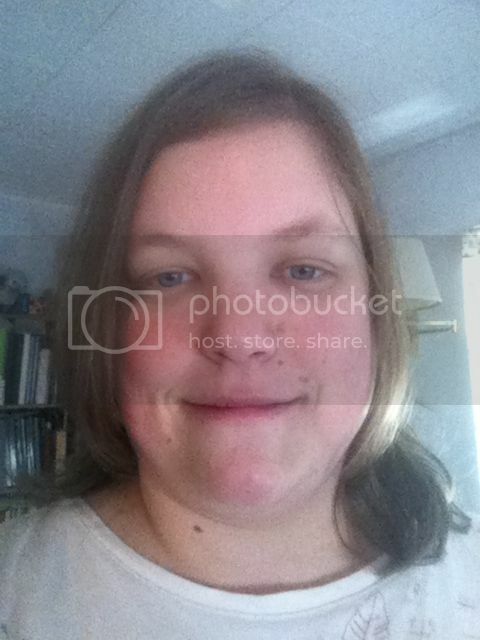 Miriam has never felt particularly beautiful, especially because she’s always been a bit heavier than other girls her age. When Junior, the man she’s pined for all her life, suddenly seeks her out, she’s thrilled to be noticed . . . until she realizes he’s only asking her to help get the attention of Mary Kathryn Hershberger, her pretty friend. If Miriam helps Junior court Mary Kathryn, she’ll get to spend a lot of time with him, but she might lose him in the process. Are these few stolen moments worth a lifetime of sacrifice? Is Miriam right to even hope for the life she dreams of? You can purchase a copy by visiting Shelley Shepard Gray’s site. You can learn more by visiting her website. I’ve had the pleasure of reading Gray’s books before and the fact that she’s a fellow Ohioan and the book takes place in Sugarcreek, well I was bound to get caught up in the story. 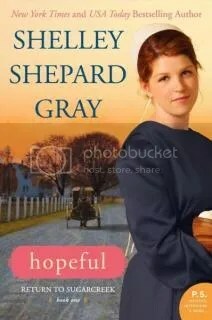 Lately, I’ve been jumping into the middle of a series and floundering, but thankfully I read, Hopeful, which is book 1 in the new series, Return to Sugarcreek, so I can read them in order. Miriam Zehr is the main character and she longs to be noticed by Junior, who she has her heart set on, but alas he only wants to get to know her friend and newcomer, Mary Kate – but she has secrets and wants nothing to do with Junior or any man. While I found myself wanting to yell at Miriam to just tell Junior and refuse to help him catch another girl I knew eventually Junior would find out which woman was for him – the romance part was pretty easy to figure out. I enjoyed the suspense in the novel – Mary Kate, who is scared and goes to work and goes straight home – knowing she has secrets keeps the pace of the novel as Miriam tries to help her. Eventually, it’s easy to figure out what has Mary Kate so easily spooked and why she doesn’t want to really reach out to others in her community and the reader’s heart wants to reach out and help her. While the book is short, the plot is anything but, with real characters and issues leap from the pages and makes for a quick read the book is full of details. Miriam wants to help everyone, she is quick to help and struggles with not being able to help as much as she wants, Junior struggles to know how to raise a family he was left with when his parents died – ultimately the characters realize they need to quit relying on themselves and rely only on the Lord, only then do the characters end up where they are supposed to. If you’d like to see what others thought about Hopeful visit the Litfuse Landing Page. Best-selling author Sheri Rose Shepherd uses charming princess characters and easy-to-understand Bible stories to help share spiritual wisdom and truths in this sweetly illustrated Bible storybook. This is a wonderful introduction to the Bible for even the tiniest of princesses! Bible Stories for His Beautiful Princess is a fresh way to teach little girls—toddlers and preschoolers—the foundations of the Christian faith. Simple lessons on how to know God, learning to pray, having faith, and understanding right from wrong make this the perfect first Bible. Using charming and engaging illustrations on every spread, princess-themed lessons, and easy-to-understand verses from the NLT, this Bible storybook will get little girls excited about engaging with God’s Word. You can purchase a copy at Tyndale. 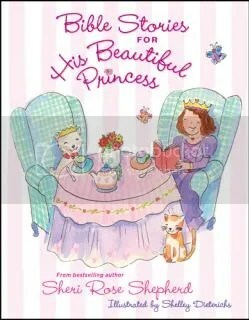 I requested this book for my 9 year old daughter as she enjoys the pink, princess-y stuff so this was right up her alley and I liked the idea of having Scripture and God’s Truths woven into the girly theme. She loves it! I must say that I too like it but while I do it’s definitely too young for my daughter – however it would be great for a younger girl who is just starting to read or for a mom to read with a daughter who isn’t at the reading stage yet. The Bible verses are taken from the NLT Bible so they provide an easy to read and understand translation of the Bible for young readers and there are 37 Bible stories from the Creation of the world to Christ’s death and resurrection. As I said I did enjoy this and my daughter is still enjoying reading it but as I went through it on my own I must say I had a couple reservations, the first being that these Biblical truths are a re-telling and come across more as stories than as real, historical events. In light of that some issues are glossed over, sin is not mentioned in the telling of Adam and Eve or Noah and there are only 2 of the 10 commandments given. I know I’m probably nit picking, it’s a book for younger girls who may not be ready for such larger issues but I’ve preferred to tell my children the whole story and also I try not to refer to the Bible as stories as that gives a notion that the events aren’t real or that they are just stories. As I said there were some things I noticed like the birth of Christ is depicted as usual in a barn like stable surrounded by animals and the wise men visit an infant – again maybe I’m just nit picky. With that said, there were aspects I really liked – the illustrations, done by Shelley Dieterichs are beautiful water color-like paintings that give a feminine and peaceful feel through out the book. Also of note and something else I really liked was the princess prayer which was a small prayer that relates to the story and allows the child to pray on her own – and also could give the parent time to elaborate on the prayer as it relates to the event. There are princess jewels which as simple thoughts about a lesson to be learned from the event, for instance the princess jewel for the event of Moses in the basket says “God gave you a family to love and take care of you” (page 24). These can open up a discussion between the parent and the child about how one can show love to family members and what does it mean to be taken care of and how does the Heavenly Father show us love and take care of us. Overall, this is a cute book that I would be fine with giving to a young girl as a present to open the doors of giving the Truth that is contained within the Bible in an age appropriate way.